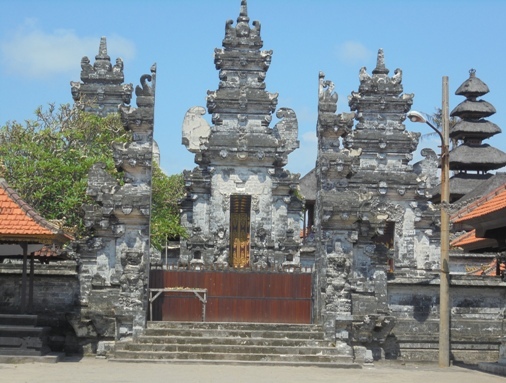 Batu Bolong Beach Canggu Bali - Scenic View and Beautiful Temple! Batu Bolong Beach is a long arc of grayish-black sandy beaches with low-lying sand, great seascape, and magical old century temple. Visitors can enjoy the breathtaking view to India Ocean, Pererenan, Kuta and Jimbaran. The beach is among traditional Balinese houses with a calm and peaceful environment. Around the coast there are still fertile rice fields, although slowly diminishing. 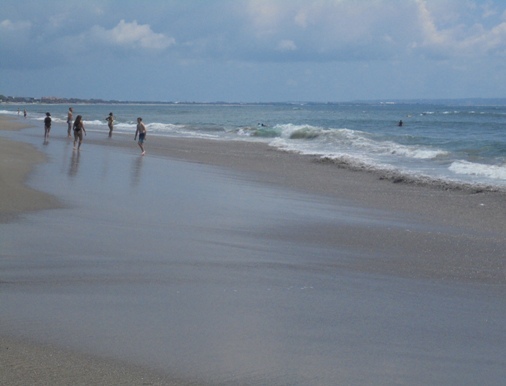 This beach is located in Canggu, North Kuta District, Badung Regency, Bali. This is less than an hour from Ngurah Rai International Airport. This spot is easily reached by car. Drive north to Kerobokan area via the Jl. Sunset Road and continue on the Jl. Raya Canggu. Follow this road until you hit the Jl. Pantai Batu Bolong and you have found it. There is extensive parking for cars/motorcycle at low fees. 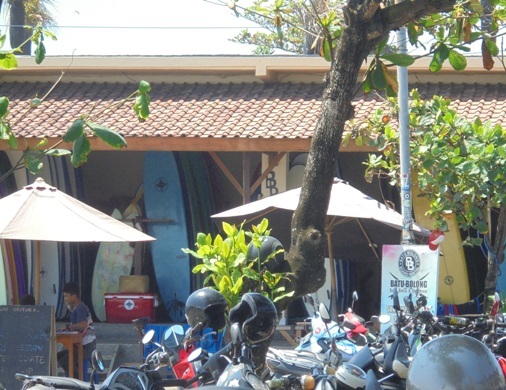 Plenty of cafes, bar, food-stall, surf board rental and also a holy temple right next to it, the Pura Batu Bolong. This holy temple is devoted to Ida Bhatara Segara. Balinese came to pray for safety and harmony. 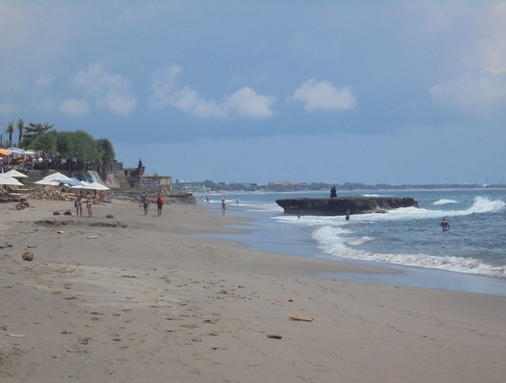 The name of the Batu Bolong is derived from the word "Batu" means stone/rock and "Bolong" means hollow. So Batu Bolong means the hollow stone. There are some ancient records or "lontar" mentioning that this sacred temple is related to the journey of the holy priests namely Mpu Kuturan (in 11th century) and Dang Hyang Nirartha (in 15th century). The beach hosted several Balinese customary rituals such as: Melasti ceremony, Mesucian, Mendak Pratima, etc. There are prohibitions: women during their periods cannot enter the temple and visitors have to use Balinse traditional outfits. This is a popular surf spots among surfers. You can rent surf board and take surf lesson here. This spot is recommended for beginners up to advanced surfers. In addition, you only need to walk for a while to reach other famous surf spots such as: Pererenan Beach, Batu Mejan (Echo Beach), Old Mans, and Berawa Beach. Besides surfing, visitors can do more relaxed activities such as sunbathing, swimming, beach-side jog or stroll along the sandy stretch. You can rent bean bag or lounger and parasol to enjoy the scenery and rolling waves, relaxing, napping, and people watching. Coconut and cold beer vendors are also available right on the beach. During the day it feels hot and a little tree, perfect for sunbathing and surfing. But, for visitors who want to enjoy a cool atmosphere, can visit during the morning or evening. This is a nice place to hang-out or picnic while relaxing with a calm and serene atmosphere. This beach is blessed with a stunning sunset panorama. The colorful strand adorns the horizon with golden shimmering sea water and the cool breeze. This is so rejuvenating and presents an endless romance.